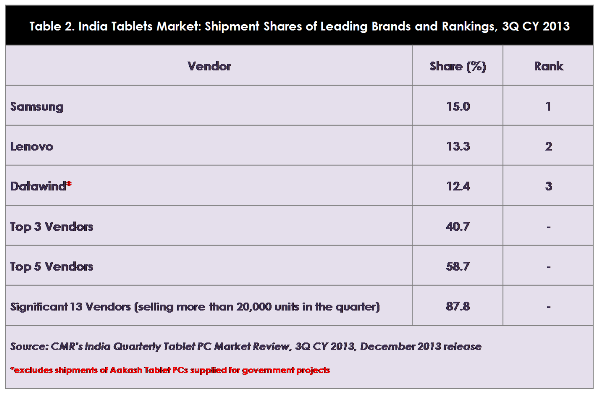 Samsung continues to sit atop of India’s tablet market, according to a new report from Cyber Media Research (CMR), which gives the Korean electronics giant a dominant 15 percent share of the estimated 1.2 million shipments between July and September. Lenovo (13.3 percent) is second — and in the top three for the first time — with local brand Micromax (12.4 percent) sitting behind in third. As you might expect, Apple’s iPad does not feature in the top three, since its product is priced at a premium that is out of reach for many in India, and other emerging markets — though these figures pre-date the launch of the iPad Air and iPad Mini 2 in India. The market is widely dispersed, with more than 13 companies shipping over 200,000 units (and cumulatively 88 percent of the industry-wide total) during the three-month period. Growth wise, the period saw shipments rise 9 percent year-on-year, and 4.7 percent on the previous quarter. CMR puts these slack figures down to “limited offerings from vendors battling BIS certification guidelines” as they bid to enter the enterprise space. Interestingly, the analyst firm is noticing more tablet vendors switching their focus to the enterprise space on account of fierce competition driving down the price of consumer tablets. CMR analyst Tarun Pathak believes there is a “more promising future for growth” among business customers in India.